In this step, you will make changes to the Configuration Table. When a service request arrives at the host, JSM checks the file DC_W29.txt on Windows or database file DC@W29 on the IBM i to identify the function to execute. The key used by JSM is the Service Name and the Host: Port. 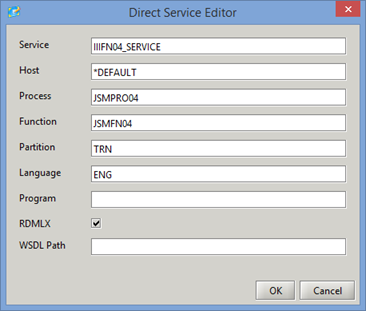 The Service Name is the part of the URL keyword value that comes after the question mark entered as the value for the URI parameter: iiiFN04_SERVICE. 2. Right click on this service and select Open Service. A list of the existing services will be displayed. This list will depend on what services have already been defined for this server. 2. Right click anywhere on a white space and select New to create a new service entry. 4. Add a new entry with the values shown, substituting your value for iii. Note that the partition may be different for your course. 5. Click OK to save your changes and close the Direct Services tab. The file DC@W29 for the correct JSM Server instance has been updated on the IBM i. If you are using http:/localhost, the file DC_W29.txt has been updated.